The jobs figure came in at a respectable level, pushing US stocks higher. The economic backdrop does look to be rebounding, but the expansion is in a tenuous state. 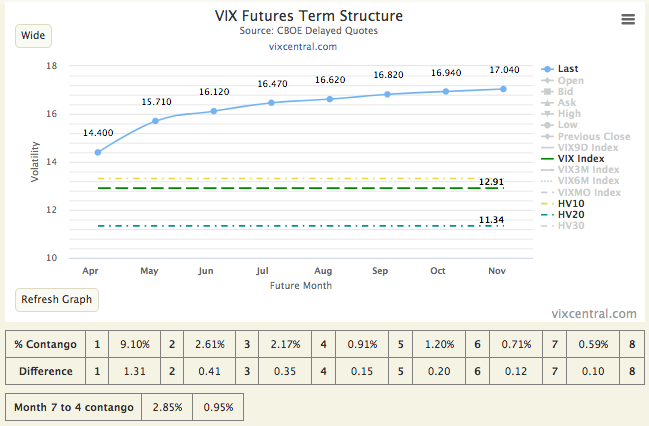 Realized vol is deceptively high (at least on a close-close basis). US stocks (SPY, DIA, QQQ, IWM) appear to have taken a decidedly positive view to the NFP release this morning from the Bureau of Labor Statistics. The bump in stock prices corresponded to spot VIX dipping below the 13 handle, with a brief (but perhaps erroneous) print as low as 12.17. Now, look, we have the worst revival of an economy since the Great Depression. And believe me: We're in a bubble right now. And the only thing that looks good is the stock market, but if you raise interest rates even a little bit, that's going to come crashing down. We are in a big, fat, ugly bubble. And we better be awfully careful. And we have a Fed that's doing political things. This Janet Yellen of the Fed. The Fed is doing political -- by keeping the interest rates at this level. 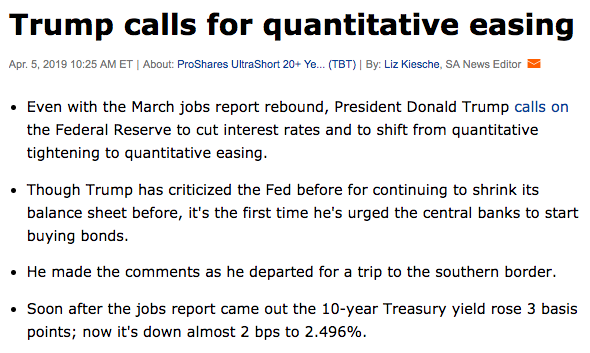 And believe me: The day Obama goes off, and he leaves, and goes out to the golf course for the rest of his life to play golf, when they raise interest rates, you're going to see some very bad things happen, because the Fed is not doing their job. The Fed is being more political than Secretary Clinton. All politicians do this to some greater or lesser extent. But say what you like, I'm calling it a reversal. ...Then again, maybe the president has a point! 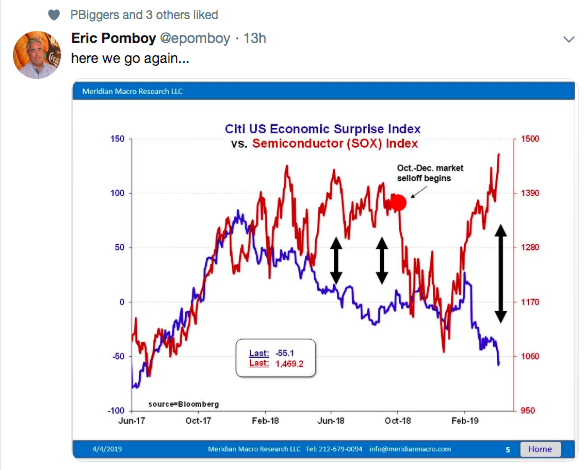 The Citi US Economic Surprise Index is certainly dropping quickly. Perhaps the trade negotiations, slowing global economy, and temporary government shutdown all took their toll and the index will reverse. But rates have receded in rapid fashion, which seems unlikely if fixed-income traders viewed the slowdown as purely transitional. 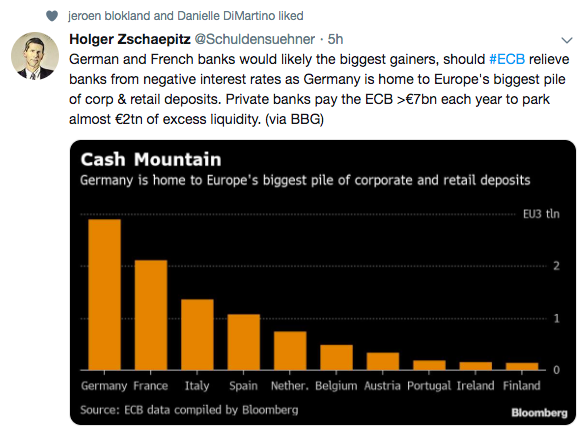 7BB euros per year to deposit funds with the ECB - we really have tried just about everything over the last decade, haven't we? Meanwhile, sovereign debts have mushroomed, while volatility wilts. It doesn't necessarily make sense, at least from some frames of thinking (consider for example Ricardian Equivalence). ...Still the VIX spills below 13. To be clear, I'm not grieving. But I do find the backdrop here to be fascinating. HV10 is still at a perky 13.31. But a good bit of that vol drops off the schedule (the HV10 rolls) by end of day today. The short vol trade (SVXY, ZIV) is really kicking some you-know-what these days. Those who took large positions in these kinds of products and strategies in a big way were taken out in a rather sudden and dramatic way last year. I mention this because I think there is plenty of reason to expect that short-vol position holders are far more likely to be nimble and book gains rather than just ride the position the way they were trained to behave between Feb '16 and Jan '18. I think a steadily falling vol here is not just muscle memory, but rather a cogent prognosis of the near-term shape of vol. Like it or not, that seems to be the single most likely market environment we currently find ourselves in. If this is your first time reading Market Volatility Bulletin, thanks for giving it a try. If you're a regular, I thank you for your ongoing contributions in the comments section. I very much appreciate this first-time comment (on the MVB anyway) from estoril. I responded to the comment here. Atom & Humber has some excellent adds in the past MVB, and so I recommend you head over and take a look at what he has to share. Additional disclosure: I actively trade the futures and options markets, potentially taking multiple positions on any given day, both long and short. I also hold a more traditional portfolio of stocks and bonds that I do not "trade". I do believe the S&P 500 is priced for poor forward-looking returns over a long time frame, and so my trading activity centers around a negative delta for hedging purposes.